CANCELLATION POLICY: We require 48 hours notice if you find you cannot keep your reservation. A 30% fee will be charged if the reservation is not kept. * If you stay 5 nights, the 6th night is FREE. Spend a night or two. a weekend or even a week in one of our "Company Houses", and let the serenity of the rippling sounds of Paunch Creek, beautiful wildflowers, and the high cliffs enclose you in the peaceful time gone by. 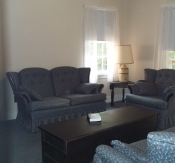 We have 12 centrally air-conditioned and heated "Company Houses", 9 with two bedrooms and 3 with one bedroom. (One bedroom houses have hide-a-bed sofas an will sleep four people.) Each house has a living room, full bath, kitchen and dining area with refrigerator, microwave, toaster and coffee maker. All of the houses have porches with swings and have spectacular views of the Camp and Paunch Creek. All linens are furnished and maid service is available upon request. The "Company Houses" at the Barthell Coal Mining Camp are unique in that they are reconstructed on original sites from original floor plans of the original by the Stearns Coal and Lumber Company in the early 20th century with the exception of added bathrooms. The houses have been reconstructed with original exteriors using hemlock lumber milled in McCreary County and poplar lumber milled in Tennessee. The interiors are modern for today's comforts. A stay at the Barthell Mining Camp is ideal for couple and families looking for a quiet out-of-the-way place centrally located in an area rich in scenic beauty with many interesting places to visit within an hours drive. The camp is located in the Daniel Boone National Forest and adjacent to the Big South Fork River and Recreational Area, the nation's newest National Park.